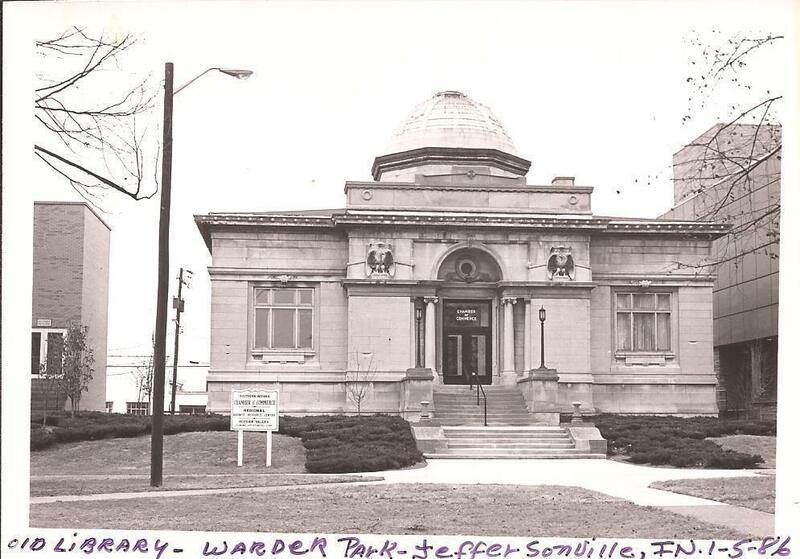 This photograph is from one of Mama's very old photo albums of buildings in Clarksville, Indiana. The post office is in another building now, and even in 1972 when this photograph was taken, the post office looks as if it is empty and out of business. Looking at the photo more closely, though, I am almost sure that is Mama mailing a letter at the post office, so maybe it was still in operation in 1972. I do not remember any post office building at this location. I am going to try to find out some more information about the old post office and will post anything I find out here later on. Mariette's Nightmare Bookstore is a new page I am adding for book reviews of books that I have enjoyed reading and that may be of interest to other people also. This page will be only for copyright books that are for sale. Later I will make another page titled, Mariette's Nightmare Library, for reviews and links to public domain books that are free to read online. I will need to find a suitable photo for the library page before I make it. 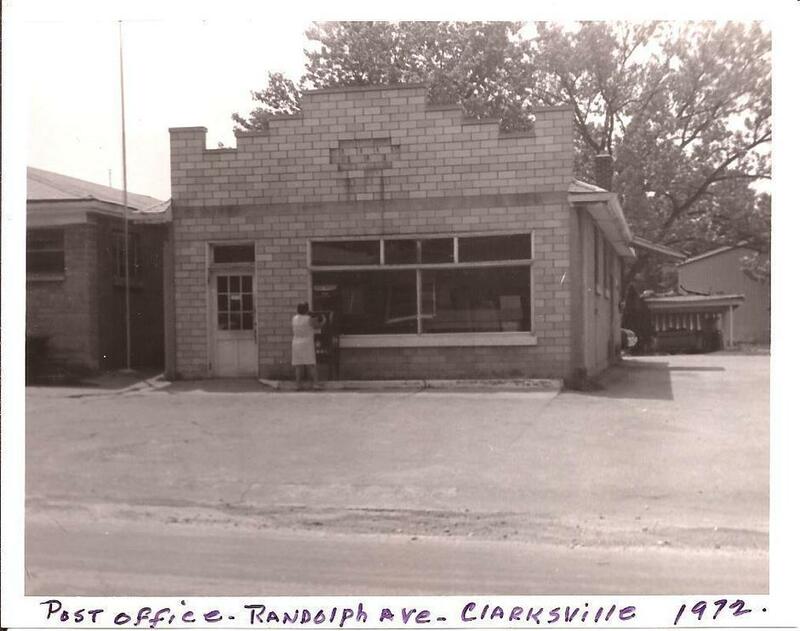 Although this is the old Clarksville post office, not a bookstore, this photograph looks like I imagine Mariette's Nightmare Bookstore would look. I have a couple of books in mind to review for the bookstore page and also for the library page. I will post the first reviews and where to buy the books as soon as I get the reviews written, hopefully soon. I did not really mean to start making this page today, but have had trouble with Computer Boy and was unable to access my Doodlekit page to work on it today. So I made this entry on my new Laptop Computer Boy to make sure if it was the computer or the website temporarily down. Everything seems to work O.K. with Laptop Computer Boy, but he says his battery is down and he needs to be plugged back in, so I'd better close for now. I don't know as much as I should about how to use him yet, as I just got him recently for a back-up computer. I just plugged Laptop Computer Boy up so I can finish this post. I guess he can be used indefinitely with electricity, but I will finish this diary post and shut down for awhile anyway, and let his battery charge back up. Charles worked on Computer Boy last week fixing him. He worked 3 days. I guess he must have been getting tired, because the screen display showed all the pages all spread out. I think that was the problem because I reset the display to fit the monitor, which he probably forgot to do, and everything seems to look all right now, except that I'm not sure how to make the icons big again like they were. I will figure that out later. I don't want to bother him again after he did all that work for me just to help me out! I am adding this note before quitting work for awhile to make sure everything is O.K. i guess everything is all right on Computer Boy now. The website looks fine now and fits on the screen. I was unable to upload any photos to Doodlekit before and that was really a problem because the photos are as important a part of the website as the text. I uploaded one as a test to the library, a plate of salad Charles had at one of his cook outs. It is in the Doodlekit Library now in case I want to use it for anything! I was able before to upload the post office photo to my OneDrive, then downloaded to Laptop Computer Boy, and from there uploaded to the Doodlekit Library, and finally to this page! A round about way to do it, but there is usually a way to get around any problems. I remember when Steve, Gain's and my neighbor, used to help us keep our computers fixed, he told me, "You can't be afraid of the computer. It is impossible to tear it up unless you hit it with a hammer." So I remembered that bit of advice and was able to get Computer Boy working again, and also learned a bit more about him and Laptop Computer Boy! I don't know nearly as much as my brother, Charles, does, but I know a little more than I did before! So check back soon for book reviews! The reviews will be posted as future blog posts. After mentioning the salad photograph I thought I might as well include it here to add a little something extra to this post. This is the Easter salad Charles had for the hamburgers he grilled for the Easter cook out party he had at his house in 2016. If you have any use for the salad photo it, like all the photos on my website, can be downloaded. Just right click the mouse to save them to your computer. Cherie told me that this can be done when she was helping me with the website and I wrote to her at Doodlekit. I checked, and it is definitely possible to do this! I right clicked twice--if your computer is set different than mine, it might only take once, but use the right mouse button. You can use any of the photos for whatever you like. I don't care. If you have little girls you can print the salad photo out, paste it on cardboard (old cereal boxes are O.K. ), cut the picture out, and let them help make toy food for their dolls. When I was a little girl I made toy food by cutting pictures out of old magazines and making it this way, which can also be done to make a large selection of doll meals! Even now I still make toy food this way and scan the original pictures. I have a three drawer plastic filing cabinet in my kitchen. The top drawer is for recipes I want to try before filing the ones I want to keep. The middle drawer is for recipe and cooking articles I'm saving. The bottom drawer has all of the "toy food" I've made. I scan the originals in case they wear out and I need to make more. If I want to buy bread, for instance, rather than making a note, I just set out the "toy food bread". "Dead Donna" is one of my Halloween Creatures, who lives in the "Halloween Library" I am making in the basement, and where all the Halloween Creatures and decorations will be on permanent display. She cooks for all my other "Creatures" (my stuffed animals and dolls). She claims all the toy food and only lets me borrow it if I promise to be very careful with it! There is a lot still to do, but when the "Halloween Library" is completed I will include photos of Dead Donna and some of the other Halloween decorations in a blog post on this website. I originally got Dead Donna at K-Mart, but since all the stores discontinue the old decorations and get new ones each year, I have never seen another doll exactly like her. Mama carefully made a place in the basement for her, as she is too big to keep upstairs, and she still hangs where Mama so carefully placed her for me. Just a quick diary entry this afternoon before I try to finish this web page today. Computer Boy is still not working right, but I am trying to get all of my photos and other files off of him before saying anything to Charles. I will never risk that much on the hard drive again, but will keep it regularly filed to my One Drive! I get a bit more filed each evening when I work on this project for an hour or so. I have a lot of photos to file! This afternoon I am going to try to finish this web page and, if I have time, also make the page for reviews of public domain books available on the Internet. That page will also have articles on how to make your own library. The book store page will also have articles about this. Yesterday I gathered all the material I need for both pages, as well as what I need for a blog post of the next chapter of Mariette's story, Nightmare House. Whether I can get all of this done on Laptop Computer Boy, which is what I am mostly using now, and still don't know as much as I should about, remains to be seen. I will get what I can done! Once I get the new bookstore and library pages finished, though, all new entries for both pages will be blog posts, so that will be much less work. It is very hot and humid today. The clouds have been gradually building up all day, slowly shutting out the sun. Hammerhead says it is supposed to rain later today, but I don't think there will be any rain or thunderstorms until evening, so I will work while I can. Charles says that the new computers are very unlikely to be hurt by lightning and that he never turns his computer off, but I always turn Computer Boy off at the first sound of any thunder or glimpse of lightning. I see no reason to risk his electronic life so I can play a little longer! I will also add this quick note to the diary while I think about it. I haven't had time to web up the Clark County Historical Society or go to the library to try to find out more information about the old post office yet. I sent the photo to Charles recently, though, and he checked Google Earth, I think he said the program he had was called. He said that it appeared that the building was no longer there and that there seemed to be a garage or some kind of business there now. I immediately knew where he meant, as that is the route I take when I go to pick Hammerhead up each morning to go to breakfast and any shopping his wants to do. (Hammerhead is my adopted Daddy. He is 89 and no longer drives.) The building is indeed gone, replaced by a place that sells used cars, and maybe does some other kind of business. I will post more on the history of the old post office when I find out more. This is a photograph of one of Mama's August lilies that I took with Cell Phone Boy on the evening of August 5, 2016 Friday. She has August lilies in the front and the side yards that come back every year. I enjoy looking at her beautiful flowers that she planted so long ago without having to do anything else to them. August lilies are perennials that come back every year. They bloom in late July or early August. 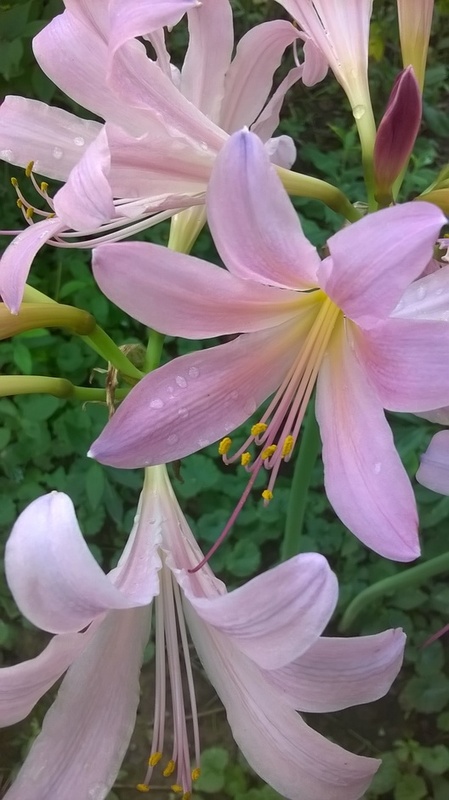 There are August lilies all over town in full bloom now. Mae Kreutzer, Mama's neighbor, now long gone like the flowers she loved so much, always called them surprise lilies because they suddenly, almost overnight, sprout bare stems where there was nothing before. The leaves do not come until the flowers are withered away. This photograph was also taken in my yard the evening of August 5, 2016 Friday with Cell Phone Boy. Mama has pink and white phlox scattered all over the yard now. There is more pink than white. In this photo the phlox has a lavender cast, but it was getting toward late evening and the light was fading when I decided to go out and get photos. The flowers fade so fast, one kind giving way to the next kind constantly. If I don't "patrol for flowers", as I call it, and preserve them on "film" while I can, they are quickly gone. The next year I can probably get more flowers of the same kind, but never that particular one. 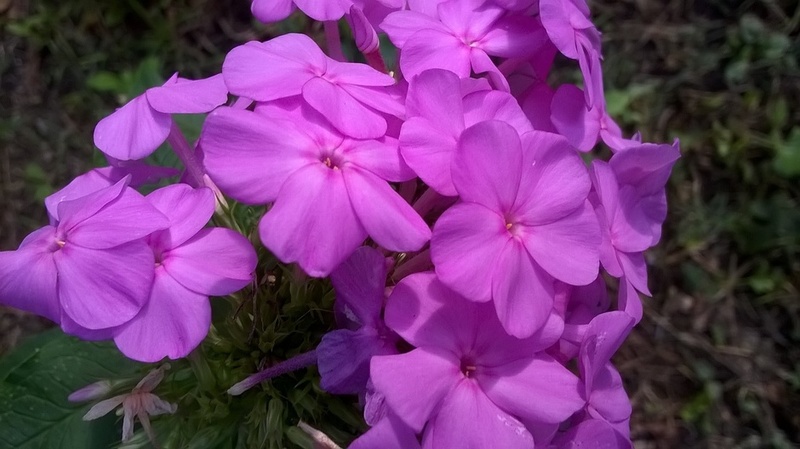 These flowers are wild phlox, not the tame creeping phlox. I am sure Mama probably did not plant so many of them, especially not outside the yard. She would not have planted her flowers where it wasn't really her property. But every year there are more of them, so they must spread and multiply. 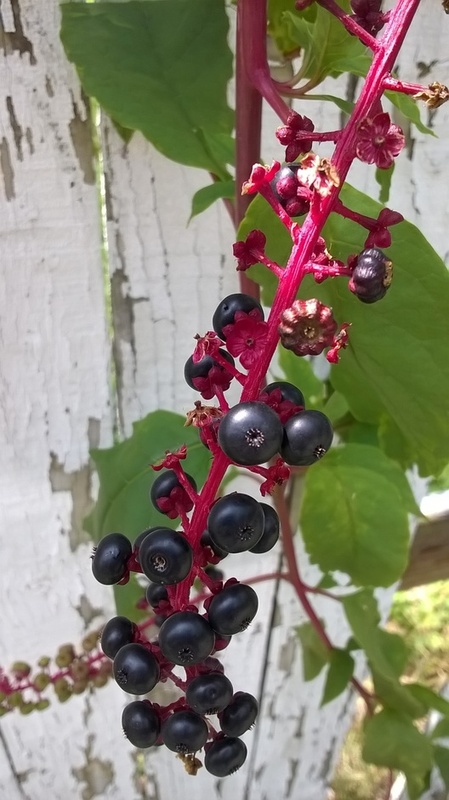 When I get time I want to web them up and find out if they are annuals or perennials, although I am pretty sure they are annuals that spread by dropping their seeds. All the more reason to save as many as I can with my camera so that their brief lives can be given a kind of virtual immortality. Later as I find out more about the various flowers that I post photos of, I will share the information here. That night Mariette found herself walking down one of the dark streets in the Nightmare City Without A Name. It was in the business section of the city, but the stores in this part of the city were all shabby, forever on the verge of going out of business. It was night. Mariette thought it must be late, close to closing time. Some of the stores were already closed, but a few of them were open. As Mariette walked the stores became more shabby and more of them were closed. Some of them were out of business, their fronts boarded up. They looked as if they'd been out of business for a long time. Weeds grew up between the cracks in the sidewalks. Mariette was alone on this street except for a few faint shadowy figures she saw through the dirty plate glass fronts of the occasional dimly lighted stores. She wanted to turn back, but she knew that she couldn't. She could never turn back when she walked the streets of Nightmare City. At the end of the street Mariette came to a ramshackle store. It looked very old, as if it had been there many years. At first she thought that it was closed, and she was relieved that she didn't have to go inside. When she tried the door knob, though, it opened into a dimly lighted interior. A woman stood at the cash register. She didn't acknowledge Mariette, or even appear to realize that she had a customer. Mariette saw that the store's interior stretched back into a dim infinity. She knew that there was a basement made up of two larger rooms. This was the second hand store in Old Albany where Mariette had shopped with her mother when she was a very small child and the family had lived in Midway. Mariette passed bins of shabby clothes as she made her way into the interior of the store. At last she reached the place she had been looking for. Book shelves held quantities of second hand books. There were old hardcover books, long out of print by authors whose names had long been forgotten, as well as more recent paperbacks that had passed through the new book stores, and now were for sale to readers who hadn't been able to afford them when they were new. Mariette picked up one of the old hardcover books, flipping through its pages. It, like the rest of the old books, wasn't an antique, just old. Once the author had the same high hopes as Mariette did now. Perhaps she had even been famous in her time, but time had moved on. Mariette wondered how many copies of Margie Hall's Sunrise were still in existence. 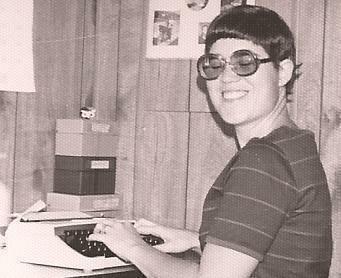 When they were gone, Margie Hall would be gone too because no one would bother printing more copies. A feeling of sadness as heavy as the dark shadows in Nightmare House came over Mariette. Because she knew that was where she was. The dark streets of Nightmare City Without A Name and even this old second hand store were all one of the many facades of Nightmare House. In spite of the growing fear that Mariette felt, the books inspired the familiar feeling of book greed in her. She checked her money. At 10 cents each she could buy a lot of them. She laid Margie Hall's book, Sunrise, on the floor, adding to the growing stack of books she wanted to buy. She turned her attention to the paperbacks. She spotted a copy of New Canaan by Steven Kingsley. Eagerly she searched the stacks for more books by Steven Kingsley. She found more and more books by him. She laid them on the stack on the floor. Perhaps she could find all of the books he'd ever written here. She found another book, a hardcover mixed in with the paperbacks. It was a biography of Steven Kingsley! She laid that with the books she wanted to buy. Mariette woke up before she could buy any of the books. Her heart was pounding and her mind felt fuzzy with mingled terror and the remembered greed of almost having all those books. That night Vicky, Steven Kingsley, and Robin Michaels shared her dream. Robin was devastated not to see any of her books for sale even in shabby Nightmare Bookstore. In her dream she knew that not even one copy of her books survived to be sold there. Steven Kingsley lay awake a long time, wondering what the nightmare meant. Vicky had only a vague memory of Nightmare Bookstore when she awoke, but she lay awake for several hours in the dark hours of the early morning, too afraid to go back to sleep. That night Mariette shopped in the dark arcades of Nightmare Bookstore again. She was walking in the Nightmare City Without A Name on the street of stores that were forever on the verge of going out of business. Tonight she knew where she was going. She quickened her steps, hurrying toward Nightmare Bookstore. She hurried further and further from the downtown area, where the shabby stores at least pretended to do business. Mariette knew that the city was only another disguise of monstrous Nightmare House that had haunted her dreams since she was a little girl. She was aware that she was going deeper and deeper into the city. Eventually she would be hopelessly lost with no possibility of finding her way out. The familiar nightmare terror gripped her heart, but she had to go on. She wanted to go on. Tonight Nightmare Bookstore was having a very special sale just for her. Nightmare Bookstore was at the very end of a dark street where weeds grew in the cracks of the sidewalk. Mariette realized that she had been walking for some time in a neighborhood where all of the stores were boarded up. The boarded up buildings had that hard times look that stores get after they have been out of business for many years. At first Mariette thought that Nightmare Bookstore had gone out of business too. There were no lights in the store and it looked empty. Sharp disappointment filled Mariette. She pressed her face against the dirty glass of the door. The store wasn't quite dark, she now saw. There was a dim light inside. Longingly she looked at the books. Books, books, books piled everywhere in disordered stacks. The store was crammed full of second hand books. A feeling of crawling evil reaching out for her seemed to come from the books. Mariette knew the feeling well. It was the ancient evil that always came from Nightmare House, as if it was a giant spider, its rooms the web, and Mariette the helplessly trapped insect. Mariette's feet wanted to run, but she reached for the old-fashioned white porcelain door knob instead. She realized then that the door was the old house's door. Before she could grasp the door knob, the door was opened from inside. It swung in smoothly and easily. "Welcome, Mariette. Welcome to Nightmare Bookstore." Steven Kingsley was standing in the doorway. Joy at seeing her idol filled Mariette. The terror didn't go away, but it receded to a dull manageable fear. "When did you buy Nightmare Bookstore?" she asked. "Oh, I bought it long ago, just as you are going to buy it, Mariette." He smiled. It wasn't a pleasant smile and his eyes glittered with repressed madness. "What do you mean?" Mariette ignored the voice of caution, telling her that she ought to run, not walk, as fast as she could and as far as she could. Away from Steven Kingsley and his Nightmare Bookstore. She stepped over the threshold. The smell in the store was the same musty smell as the old house had she realized. Beneath the old building smell was the dry rotting paper smell of old books. The stacks of old books overflowed every nook and corner of Nightmare Bookstore. In the middle of the room, the first thing a customer would see when he entered the store, was a table piled high with new books. Mariette recognized the white dust jacket with stark black lettering. She had seen stacks of similar volumes in the window at the Book Nook in the Libertyville Mall. They were Steven Kingsley's latest book, a collection of short stories called Nightmare Country. Steve Kingsley watched his Number 1 fan devouring the stacks of Nightmare Country books with her eyes. He smiled again. His teeth gleamed as white as the teeth of a skull in the dim dusty light. Suddenly Mariette was terrified, more terrified than she'd ever been before. And terror was one thing she knew well. Nightmare House was just another word for terror. She cast one more longing look at the Nightmare Country books before running back to the door. "The door is locked. It always is, isn't it?" Mariette had discovered that fact for herself at the exact moment that Steven Kingsley spoke. She whirled around to face him. He was standing right behind her now and the look in his eyes, behind his thick glasses, wasn't sane. Mariette twisted the old-fashioned white porcelain door knob, the same door knob as the one on the old house's door. It turned in her hand, but the door didn't open. She pounded on the thick dirty glass in the windows. "Welcome to Nightmare Country, Mariette," Steven Kingsley said. Gently he led her away from the door, back to the stack of his books piled on the table. Mariette allowed herself to be taken back into the depths of Nightmare Bookstore, a feeling of fatalism beginning to override the terror. The terror was still there, though, and she knew it always would be. Steven Kingsley smiled his white death smile again. "The book greed always overrides everything, doesn't it? Never mind, we've bought the store; we might as well enjoy the books, don't you think?" Mariette woke up, her heart pounding and the smothering feeling of evil seeming to reach out of the dark for her. She touched Curt, relieved not to be alone at 2 A.M. As she lay there, coming down from the high of the nightmare, she realized that Steven Kingsley never had answered her question. What could he have meant when he'd told her that he'd bought Nightmare Bookstore? Even more important, what had he meant when he'd assured Mariette that she was going to buy Nightmare Bookstore too? Terrible as the dream had been, Mariette felt a lingering disappointment that she'd woke up before she'd gotten to read Steven Kingsley's latest book Nightmare Country. It wouldn't be out in paperback until next summer. These are a couple of the many knickknacks Mama had. I took this photograph April 20, 2015 when I was working on getting the living room straightened up and cleaned, cleaning and arranging all of the statues and knickknacks. I took this photograph on July 22, 2016 Friday. I had taken Hammerhead to get groceries at Kroger's and we ate lunch in town that afternoon. On the way home, after taking him home, I stopped to take this photo. 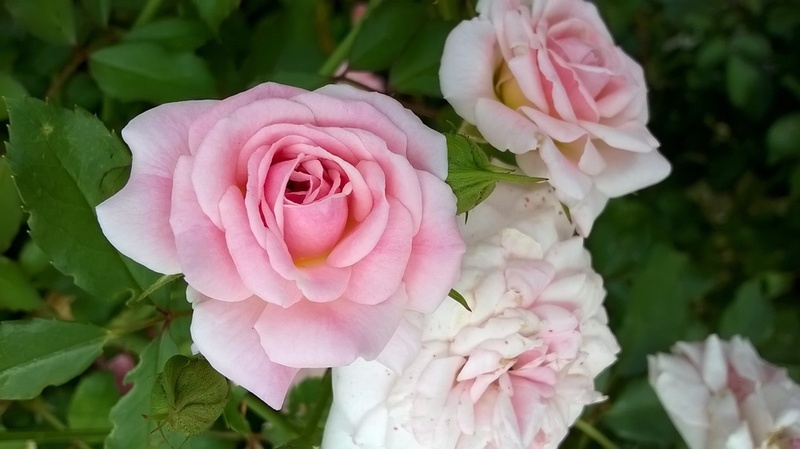 The people who have this rose bush also have lots of other flowers in their yard, and I always look to see what they have in bloom. They must really love flowers they have so many, all neatly enclosed by their white picket fence. Standing outside the yard on the sidewalk I was able to get this photo. It is getting late now, going on 9:30 P.M. so will be closing down the computer soon. I managed to get both of the new web pages, both Mariette's Nightmare Bookstore and Mariette's Nightmare Library finished today, though. I still have the blog posts of book reviews to post later, but I am starting to make too many mistakes, so think I'd better quit before I erase everything! I have a review of 'Salem's Lot by Stephen King to post to the bookstore page, along with where to buy a copy if you want it. I also have a review of a really neat, obscure writer's book to post to the library page. William Hope Hodgson has been dead for a number of years, so his books are out of copyright. I will be including the link so that you can read The House On The Borderland for free online or even download it to your computer, tablet, or cell phone, if you want to. Both books are favorites of mine, and are truly terrifying! I also have a new chapter of Mariette's book, Nightmare House to share as a blog post. There are already a few chapters of Nightmare House posted and eventually as I get the chapters typed up and new chapters written, you will be able to read the whole book for free here on this website. Mariette's book is posted to her page Mariette's Page now, but when I work again I plan to change the name of her page to Mariette's Nightmare House to go with the rest of her pages and also because that page will be only for the Nightmare House fiction. I will get the rest of the posts made as soon as I get time, so check back occasionally, if you are interested in reading more. I will also get everything proofed when I work again, so if there are mistakes, please realize that it is getting late and I'm getting tired now. Here is the link to my bookstore page on Bookemon, where you can read my first book, The Sleepwalker. If you want to read it for free online, you are welcome to do so. The link below will take you to my bookstore page. Click on my photo on that page. That will take you to my profile page where there is a picture of the book cover that you can click on to get to the book. Instead of clicking add to cart, just click on read and you can read the whole book online. If you like the book and want to later buy a hard copy, it will be greatly appreciated, but you don't have to. My website is a library, not a bookstore, and books are always free in a library. My books will always be free. 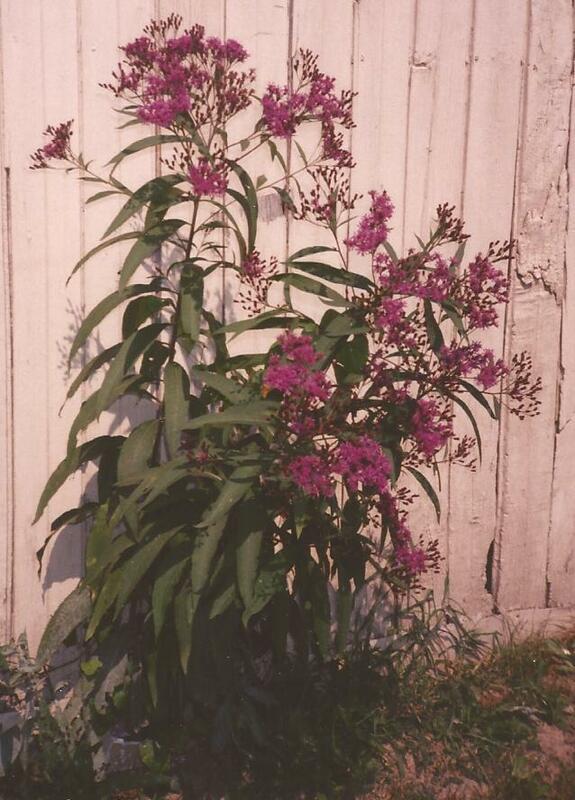 Ironweed blooms in August also. There is no purple quite like the rich shade of ironweed. This photograph is from one of Mama's very old photo albums. Pauline's Corner was a small neighborhood bar where my Daddy used to go sometimes. Mama usually waited out in the car for him while he drank a beer--she didn't like to go in any place that served alcohol. Pauline, who owned the bar, often brought Mama out a Coke and visited with her for a few minutes, Mama said. The ironweed was somewhere near there, but probably the building is gone now. After Daddy died, Mama said she wanted to let Pauline know, but she had no phone number for Pauline, and didn't want to go into a bar, and especially not alone. Mama's beautiful photo and what she told me is all that remains now of this long ago time past, a part of hers and Daddy's history.